GALION — The Galion Tigers track teams hosted their first home meet of the season on Tuesday, April 11 in Heise Park. Joining them for competition was fellow Mid-Ohio Athletic Conference members, the Pleasant Spartans and the Mount Gilead Indians of the Knox-Morrow Athletic Conference. Both the Galion boys and girls teams would come away with victories on the day. The boys team scored 70 points to outlast the runner-up Indians (66) and the Spartans (39). Over on the girls side, the Lady Tigers posted 89 points to surpass Mount Gilead (47) and Pleasant (40). Galion’s boys would win 10 out of the 17 total events, including nine individual events and one relay race. In the field events, Mason Weldon earned first place in the shot put with a heave of 44’11” while teammate Noah Atkinson claimed the win in the discus with a toss of 123’9”. Gage Lackey was a double champion in the jumping events, winning the long jump with a leap of 19’8” and the high jump with a cleared height of 6’0”. Tanner Crisman rounded out the field events with a first place finish in the pole vault, clearing 11’6”. Takoda Crisman would also pick up a fourth place point in the long jump for the Tigers. Takoda won the 100-meter dash with a blistering time of 10.51 to score four points for Galion. Colbey Fox claimed the other sprint victory for the home team by winning the 200-meter dash in 23.37. Fox and Takoda would also finish second and third, respectively, in the 400-meter dash. In the distance events, Braxton Tate claimed the title in the 1600-meter run, winning the event with a time of 4:51.4. Nate Eckert would earn a point for Galion, coming in fourth. Over in the 800-meter run, Harrison Ivy outlasted Tate by just one second to win the race with a finishing time of 2:08.3. Tate would wrap his day with a fourth place finish in the 3200-meter run. Isaiah Alsip earned runner-up points for the Tigers in the 300-meter hurdles as teammate Caleb Branstetter also picked up a point by finishing in fourth. Alsip would also finish in third place in the 110-meter hurdles for the meet. Galion won the 4×200-meter relay on the day and finished in second place in the 4×400-meter relay. The Tigers would not place in either the 4×100 or 4×800-meter relay events. The Lady Tigers would claim the top spot in nine events on the day, finishing with seven individual event wins and two relay wins. Bri Streib and Marisa Gwinner would win two events apiece in the field to pace the Galion squad on Tuesday. Streib won the shot put with a throw of 35’9” and the discus with a distance of 116’5”. Teammate Anna Court would earn fourth and third place points, respectively for the Lady Tigers in those events as well. Gwinner won the long jump with a bound of 16’8” and cleared 5’3” to win the high jump. Galion, as a team, would sweep all of the points in the long jump as Jalyn Oswald took second, Samantha Comer earned third and Alison Longwell rounded out the scoring by finishing fourth. Kerrigan Myers finished as the runner-up to Gwinner in the high jump for an additional three points. Comer and Myers would be joined by Sari Conner as the other three event winners for the Galion girls on the day. Comer outlasted Myers to win the 100-meter hurdles (15.95), with Brooklyn Cosey coming in fourth. Myers would later run a 200-meter dash time of 26.92 to win the event, finishing ahead of Gwinner (third) and Kaitlin Bailey (fourth). Conner finished off her 800-meter run with a time of 2:41.8 to earn the Tigers four points. Other Lady Tigers placements Tuesday were: Mia Brannon- 3rd, pole vault; Kayla Hardy- 4th, pole vault; Cosey- 2nd, 100-meter dash and 3rd, 300-hurdles; Oswald- 3rd, 100-meter dash; Mara Winbigler- 2nd, 400-meter dash; Comer- 2nd, 300-hurdles; Teresa House- 2nd, 3200-meter run and 4th, 1600-meter run and Airyona Nickels- 3rd, 1600-meter run. Galion’s girls relay squads would win the 4×200 and 4×100-meter relays on the day, finish seond in the 4×400-meter relay but would not place in the 4×800-meter relay earlier in the meet. The tracksters will be in action again on Thursday, April 12 when they make the trip over to compete in the Ontario Relays. On Saturday, the Tigers will head over to Mansfield to take part in the prestigious Mehock Relays. 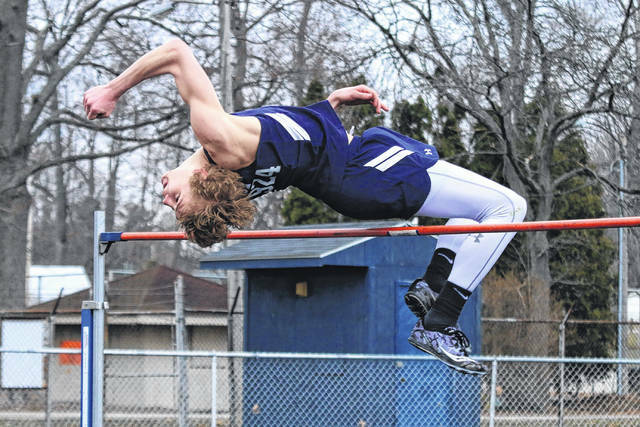 Erin Miller | Galion Inquirer Galion’s Gage Lackey, shown here in the high jump, won the event, as well as the long jump for the Tigers in their home tri-meet against Pleasant and Mount Gilead. Both the boys and girls squads for Galion won their portions of the meet on Tuesday. https://www.galioninquirer.com/wp-content/uploads/sites/38/2018/04/web1_IMG_9964.jpgErin Miller | Galion Inquirer Galion’s Gage Lackey, shown here in the high jump, won the event, as well as the long jump for the Tigers in their home tri-meet against Pleasant and Mount Gilead. Both the boys and girls squads for Galion won their portions of the meet on Tuesday.